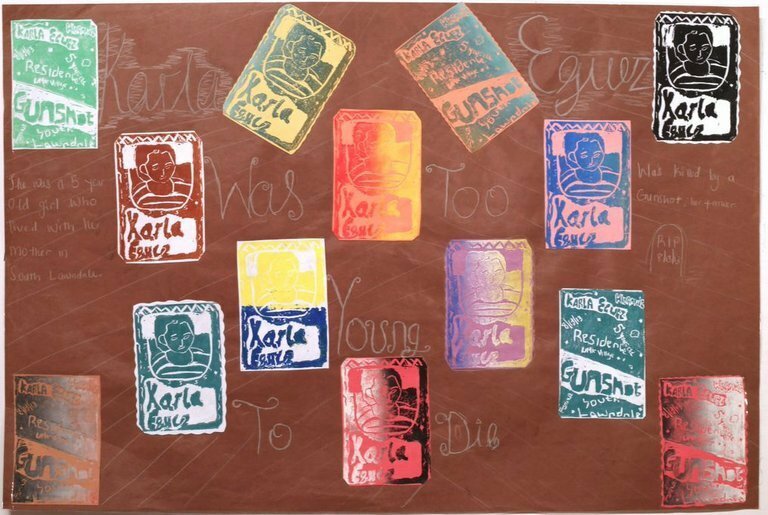 The lives of young gun violence victims in Chicago may be lost, but an art project by local high school students seeks to make sure that they are not forgotten. 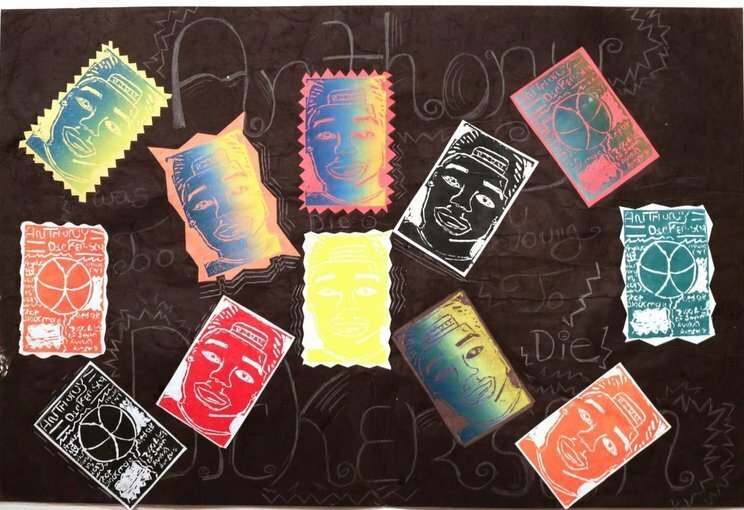 This month, the Josef Glimer Gallery in Chicago is displaying nearly 200 pieces of artwork created by Uplift Community High School students in an exhibition called “Chicago Angels Project.” The pieces, made using linoleum prints, highlight the lives of local young people who have been killed by guns. Most include pictures of a victim, along with their name and the age at which they were killed. Photo Credit: Kim Shay. Artwork created by Uplift Community High School students. Art teacher Laura Mullkoff, who has been teaching at Uplift for eight years, assigned the project to her students during the 2012-13 and 2013-14 school years. Mullkoff connected with Laurie Glenn, founder of an international art and policy salon, who helped the students’ art attain a spot at the local gallery. So far, about 30 pieces of the students’ art have been sold, with proceeds going toward their high school and anti-violence nonprofits. Students researched shooting victims and chose who they wanted to memorialize with their artwork. Some of the students personally knew the victim they chose to represent, Mulkoff said. Glenn, who helped put together the exhibition, said she hopes local legislators notice the project. At the exhibition’s opening reception, which took place earlier this month, some students spoke about their artwork or gave spoken word performances. Deangel Groves, a sophomore at Uplift, represented slain 6-month-old Jonylah Watkins in his print. Watkins died after a stray bullet entered a vehicle she was riding in with her father, according to Progress Illinois. "Killing a young girl that hasn't reached a point in life where she can learn her ABCs and 123s, she didn't get to live her life," Groves told the outlet. "So with her not being able to live her life, it's like, that could have been me when I was 6 months old ... This [exhibition] does actually bring out a message to people and gang members about where you're aiming and who you're aiming at." Below are pictures of the students’ artwork. To take action on pressing education issues, check out the Global Citizen's widget below.